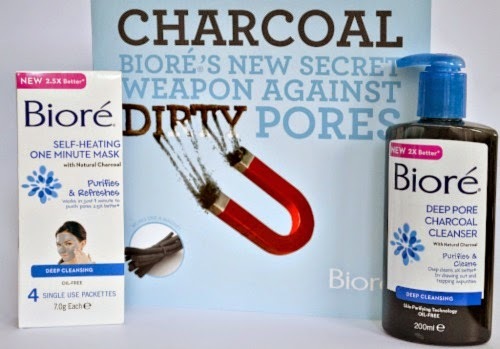 Bottled Beauty: Reviewed: Biore "Deep Pore Charcoal Cleanser" & the "Self-Heating One Minute Mask"
Reviewed: Biore "Deep Pore Charcoal Cleanser" & the "Self-Heating One Minute Mask"
I've used Biore products on and off since I was a teen. They have amazing exfoliators and everyone knows them for their pore strips. They've now released 2 new products that use natural charcoal to help remove oil and impurities and leave you with luminous and clear skin. 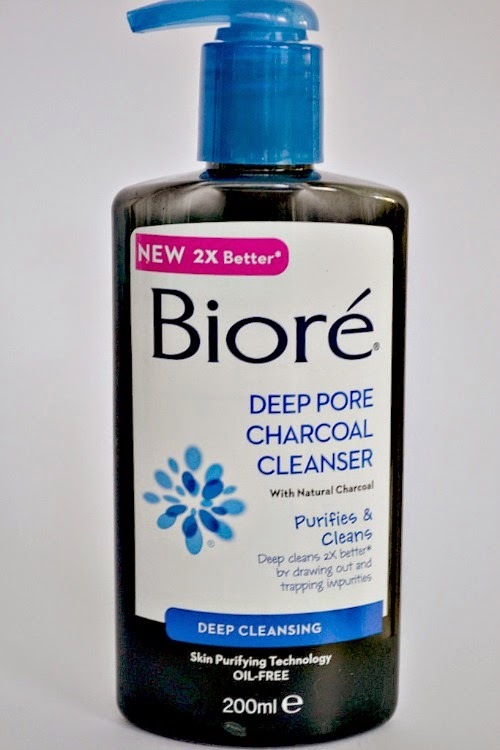 The Deep Pore Charcoal Cleanser* really surprised me. My husband currently is using the L'Oreal Men's Charcoal cleanser. The biggest difference between that and this is the smell. The L'Oreal one is quite strong and I'm not a big fan of it. Also the Biore cleanser is more of a gel. It's lighter and easier to use. My skin is usually more normal to dry in winter and I haven't found this too much for my skin. It doesn't make it feel dry or tight after using it. The cleanser is a dark gel that turns to a white foam as you massage it into your skin. I like to leave it on my skin for 30 seconds to do its thing. It has a cooling sensation. It helps to deep clean your skin and leaves your skin free of irritation. At only $10.99 for 200ml, it won't break the bank. There are 4 individual packets. There's enough of the mask in each packet to cover your face and even your neck or chest if you suffer from acne there. It helps to draw out impurities and removes dirt, oil and make up. You apply this to wet skin. On contact with the water it starts to heat up. I was really surprised at how warm it felt. I've used other heat up beauty products that feel warm for 2 seconds and then nothing. Afterwards, it has a cooling effect on my skin. It felt really refreshed. This works in as little as one minute. 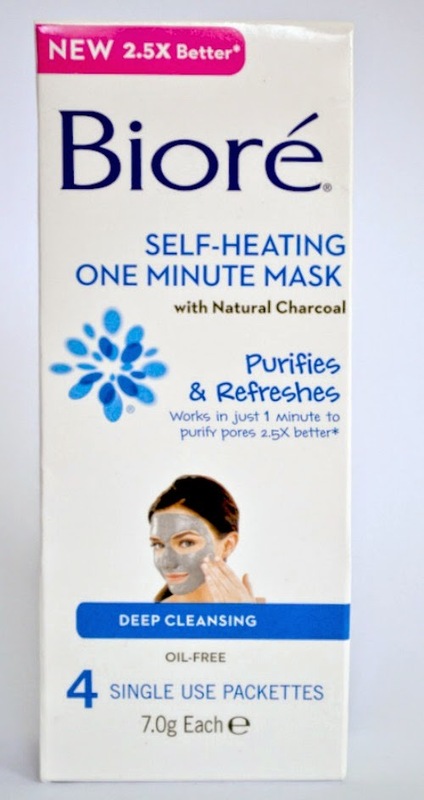 It's perfect to use when you're in a hurry, or just can't be bothered with a 20 minute face mask. It's quite dark (a grey colour) and because you apply it over wet skin it can be a bit messy. I use this in the shower to prevent the mask making mess on my bathroom sink. You're left with soft skin. My skin isn't overly oily, so for me I could use this once a week and still get clear skin benefits. For other people it would be great to use twice a week. These retails for $7.99! They're so affordable, even if you use it twice a week. Both of these products would work well with the Blemish Clearing Scrub. I've used it before and it's fantastic! It has a great consistency. It's not too rough and smells incredible! Biore is available at Priceline, supermarkets and selected pharmacies. Will you be picking up either of these? i recently tried a self-heating mask and quite liked the sensation! haven't tried anything with a cooling sensation though. these both look promisign! They sound great! I agree about the self-heating thing only lasting a few seconds, Im yet to find an impressive heating product but this mask sounds promising! I was hoping they would have these at Coles when I visited the other day but they didn't! Hopefully I can find them in Priceline sometime this week as they sound great, especially the mask! My daughter is using this and she loves it. It keeps her skin smooth and glowing. It protects her from breakouts. 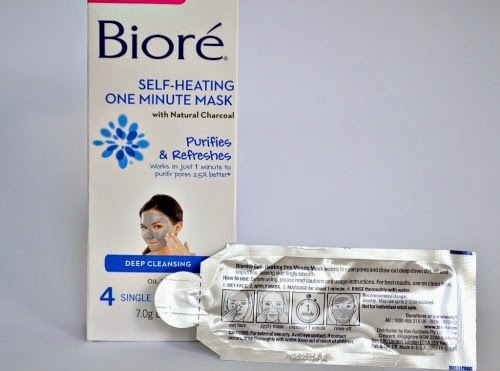 Ive never seen that biore self heating mask! I am a mask addict! I must see if these are available in Canada!